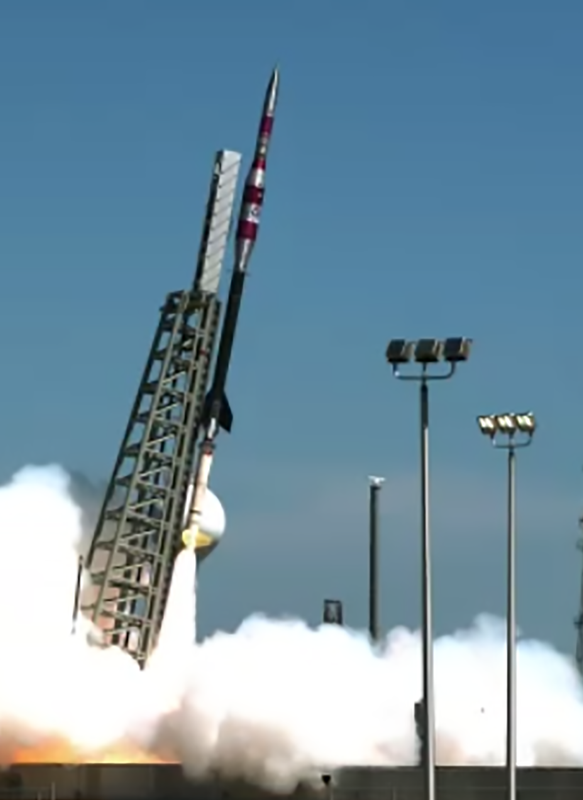 36.332 NS Black Brant IX was launched from White Sands Missile Range, NM on April 11, 2019. The aim of CLASP-2 was the detection of linear polarization (Hanle effect) of the Mg II h & k lines from the solar chromosphere, due to scattering and magnetic effects, and the detection of the circular polarization due to magnetic effects. The Hanle effect (i.e. the magnetic field induced modification of the linear polarization due to scattering processes in spectral lines) is believed to be a powerful tool for measuring the magnetic field in the upper chromosphere. 51.001 and 51.002 UE Black Brant XI-A were launched from Andoya Space Center, Norway on April 5, 2019. The AZURE mission was designed to make measurements of the atmospheric density and temperature with instruments on the rockets and deploying visible gas tracers. The vapors were released over the Norwegian Sea at 71 through 150 miles altitude. 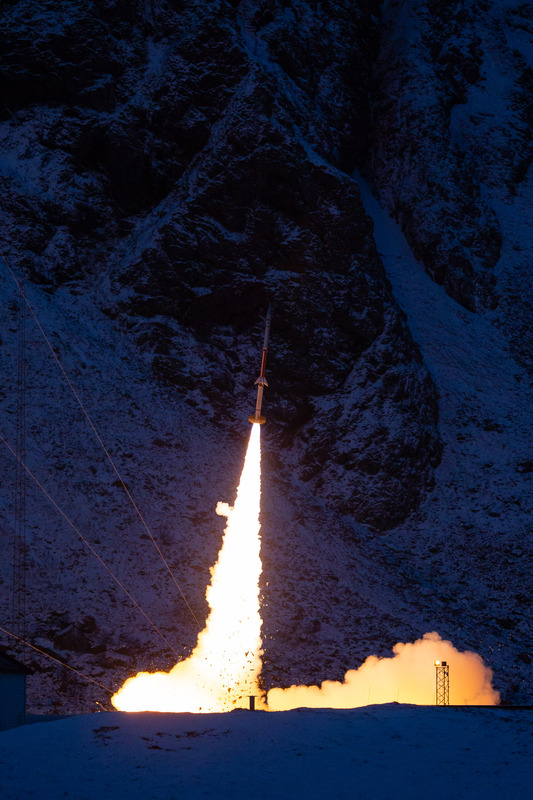 46.018 UO Terrier-Improved Malemute was launched from Andoya Space Center, Norway on January 13, 2019. This was the ninth flight of the RockSat-X mission architecture.This particular mission featured international participation by students from Norway, Japan, and the United States, including Puerto Rico. RockSat-X student experiments are developed with an objective of providing students with an enhanced experience of flying experiments exposed to the space environment. The students gain experience in the design, build, test and sub-orbital space-flight of their experiments during the mission lifecycle. 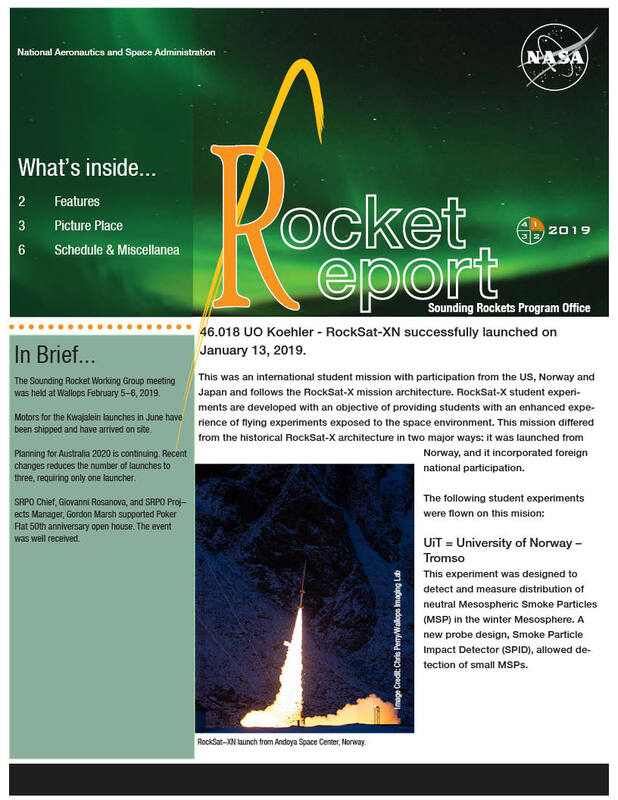 52.005 UE, Black Brant XII-A sounding rocket was launched from Andoya Space Center, Norway on January 4, 2019. This mission studied Alfven wave acceleration in the cusp by using the same key instruments that were used on complementary missions that studied night-side aurora. 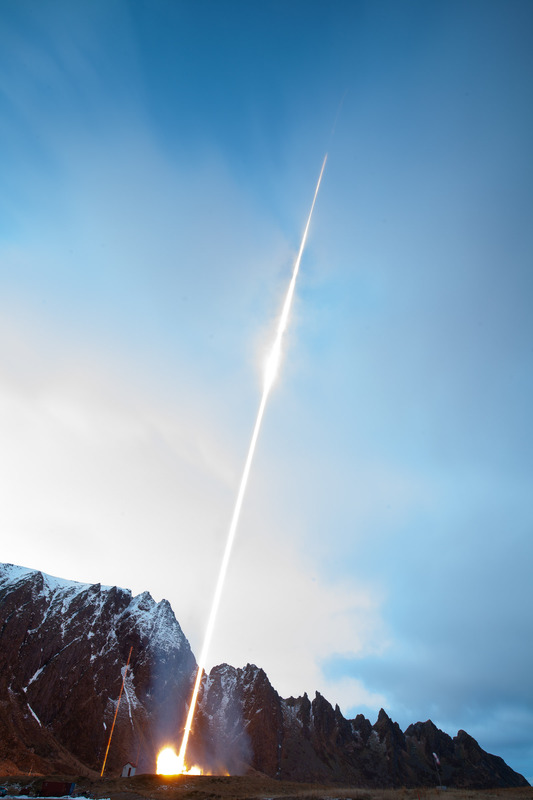 36.331 UG, Terrier-Black Brant sounding rocket was launched from White Sands Missile Range on December 18, 2018. The Dual-channel Extreme Ultraviolet Continuum Spectrograph (DEUCE) payload observed one of the only two non-white-dwarf stars in the Milky Way known to have a sufficiently low neutral hydrogen column density to measure their ionizing radiation directly: Beta Canis Major (βCMa) and Epsilon Canis Major (εCMa). The target for this mission will be εCMa. The purpose of the Twin Rockets to Investigate Cusp Electrodynamics II (TRICE-2) missions was to measure cusp signatures of reconnection occurring at the magnetopause during steady IMF Bz southward conditions. This was accomplished by launching two nearly identical instrumented payloads, flying at low and high altitudes, with a variety of separations in time and space. The purpose of the VISualizing Ion Outflow via Neutral atom Sensing-2 (VISIONS-2) missions was to study the nature and extent of low altitude ion outflow (>10 eV) from the cusp. The investigation aims to determine the spatial and temporal variations of ion outflow; the total energetic ion outflow in the remotely sensed volume; and how regions of enhanced ion outflow compare in detail to the locations of field aligned currents, optical auroral emissions, enhanced electric fields, energetic particle precipitation, wave activity, and regions of enhanced/depressed electron density. The Grand Challenge Initiative - Cusp is an international collaboration to explore the polar cusp—where Earth’s magnetic field lines bend down to meet the poles and particles from space can enter our atmosphere. Monitoring the launch from Wallops Flight Facility. 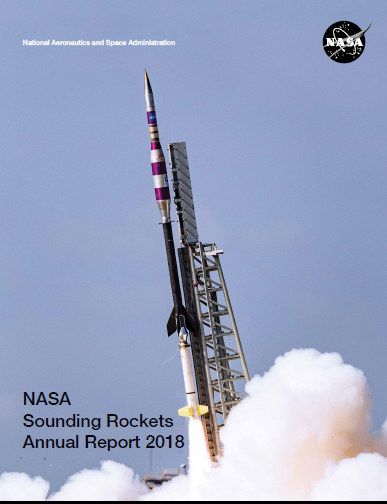 36.325 US, Terrier-Black Brant sounding rocket was launched from White Sands Missile Range on September 7, 2018. This was the 3rd flight of the FOXSI payload. FOXSI is developing an instrument that studies hard X-rays using direct focusing optics. Direct focusing optics may make it possible to observe hard X-ray emissions from quiet areas of the Sun. 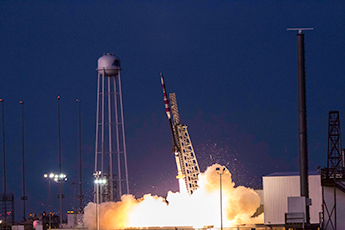 ASPIRE-3 lift-off from Wallops Island, VA.
36.328 NR, Terrier-Black Brant sounding rocket was launched from Wallops Island, VA on September 7, 2018. The purpose of this mission is to research in the physics of supersonic Disk Gap Band (DGB) parachute inflation to enable the development of the parachute required for the Mars Sample Return Sample Retrieval Lander. RockSat-X lift-off. Credit: Wallops Imaging Lab. 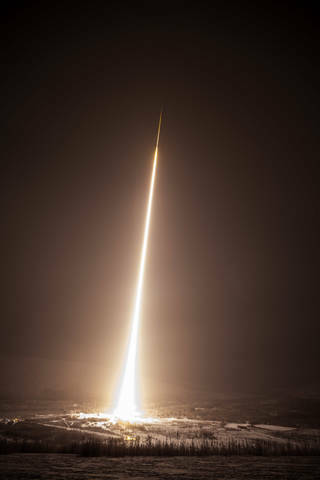 46.021 UO Terrier-Improve Malemute sounding rocket was launched from Wallops Island, VA on August 14, 2018. RockSat-X student experiments are developed with an objective of providing students with an enhanced experience of flying experiments that are exposed to the space environment. The students gain experience in designing, building, testing, and then flying their experiments on a sub-orbital space flight. It also exposes students to the design and mission lifecycle. 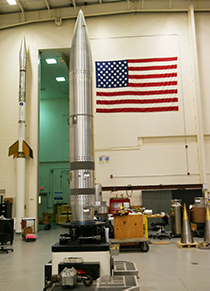 Micro-X payload at Wallops for integraiton and testing. 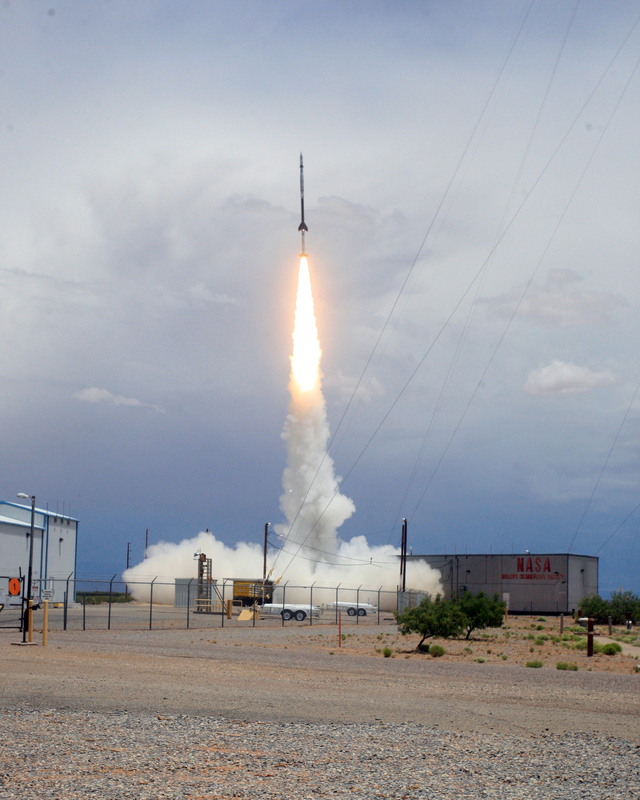 36.245 UH Terrier-Black Brant sounding rocket was launched from White Sands Missile Range, NM on July 22, 2018. This was the first flight of Micro-X. This mission was designed to investigate the plasma conditions (such as temperature, electron density and ionization) and the velocity structure of the Cassiopeia A Supernova remnant (SNR). 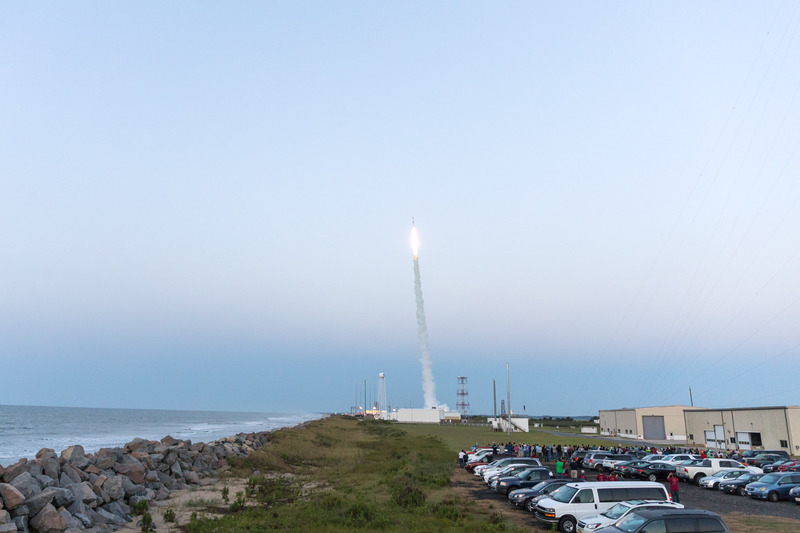 RockOn launches from Wallops Island, VA.
41.125 UO Terrier-Orion sounding rocket was launched from Wallops Island, VA on June 21, 2018. The RockOn student and faculty workshop is intended to be an introductory flight opportunity to provided exposure to, and spark interest in, space based science missions. 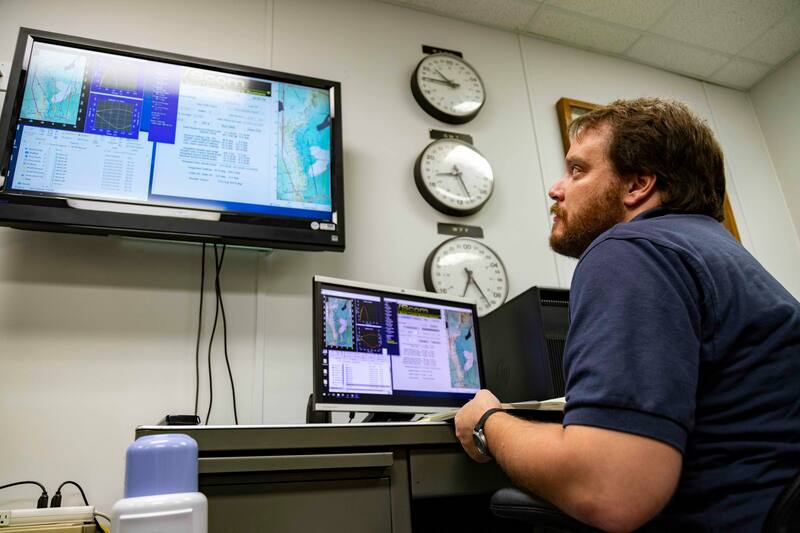 The RockOn mission is a collaborative effort between the Colorado Space Grant Consortium, the Virginia Space Grant Consortium and Wallops Flight Facility. 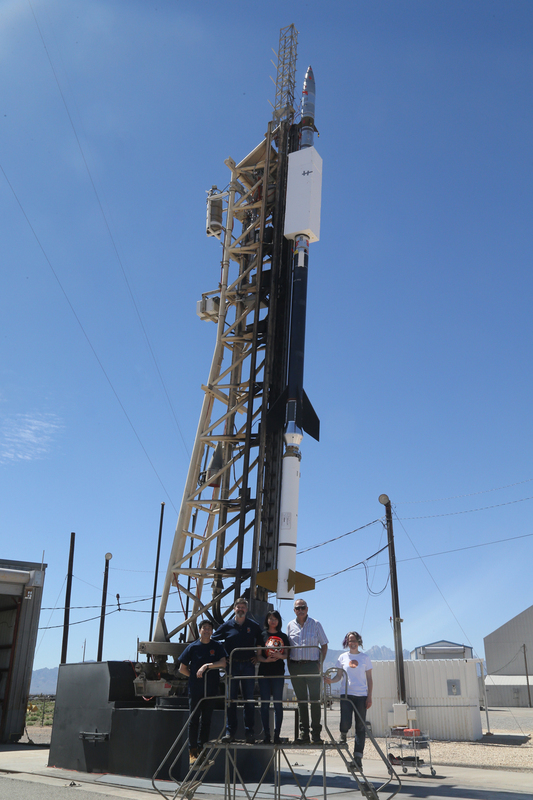 36.336 UE Terrier-Black Brant sounding rocket was launched from White Sands Missile Range, NM on June 18, 2018. 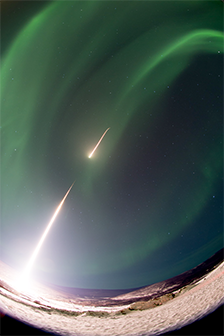 The EVE calibration sounding rockets carry a copy of the EVE instrument on NASA’s Solar Dynamics Observatory to correct for effects of degradation. Measurements from the EVE sounding rocket are used to calibrate several other extreme	ultraviolet instruments aboard other spacecraft. 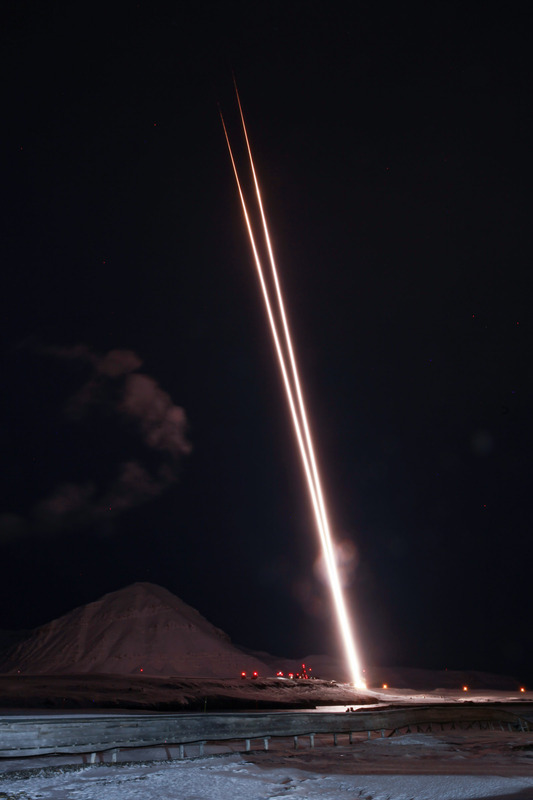 12.081-BZ DR was launched from White Sands Missile Range, NM on June 7, 2018. The purpose of this mission was to demonstrate the new two stage Terrier MK70 Boosted Zombie vehicle configuration. 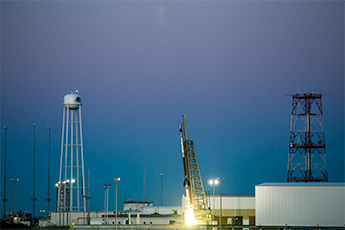 This test flight verified hardware, software, support equipment and concept of operations. 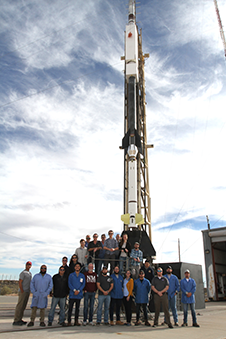 36.342 NS Terrier-Black Brant sounding rocket was launched from White Sands Missile Range, NM on May 29, 2018. The goal for Hi-C 2.1 was to look for connection between chromospheric and coronal heating. Specifically, it was Hi-C 2.1’s goal to answer if there are coronal counterparts to type II spicules and the connection between coronal, transition region, and chromopsheric heating in active region cores. CHESS launch from Roi Namur. Credit:Wallops Imaging Lab. 36.333 UG, Terrier-Black Brant sounding rocket was launched from Roi-Namur, Kwajalein Atoll, Marshall Islands on April 16, 2018. The purpose of this mission was to sudy the Local InterStellar Medium (LISM) by sampling sightlines in the lower edge of the translucent cloud regime between the diffuse and dense phases of the ISM targeting gamma Ara. WRX-R after recovery in the ocean. 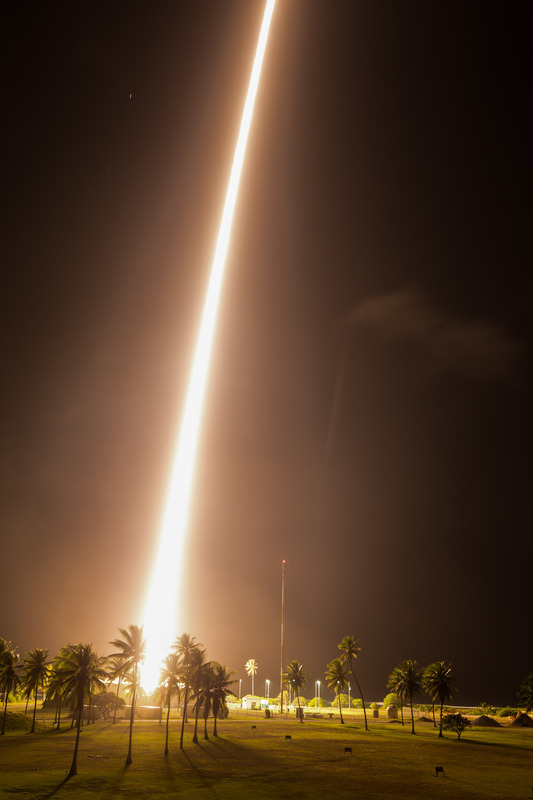 36.330 UH, Terrier-Black Brant sounding rocket was launched from Roi-Namur, Kwajalein Atoll, Marshall Islands on April 4, 2018. The purpose of this mission was to make observations of soft X-ray emissions from Vela Supernova Remnant with large field of view detector. ASPIRE 2 rocket launches from Wallops. 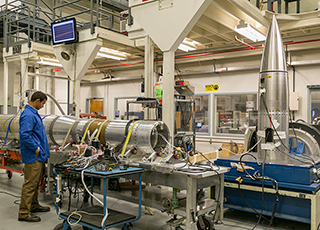 Image: Wallops Imaging Lab. 36.327 NR, Terrier-Black Brant sounding rocket was launched from Wallops Island, VA on March 31, 2018. The purpose of this mission is to research in the physics of supersonic Disk Gap Band (DGB) parachute inflation to enable the development of the parachute required for the Mars Sample Return Sample Retrieval Lander. 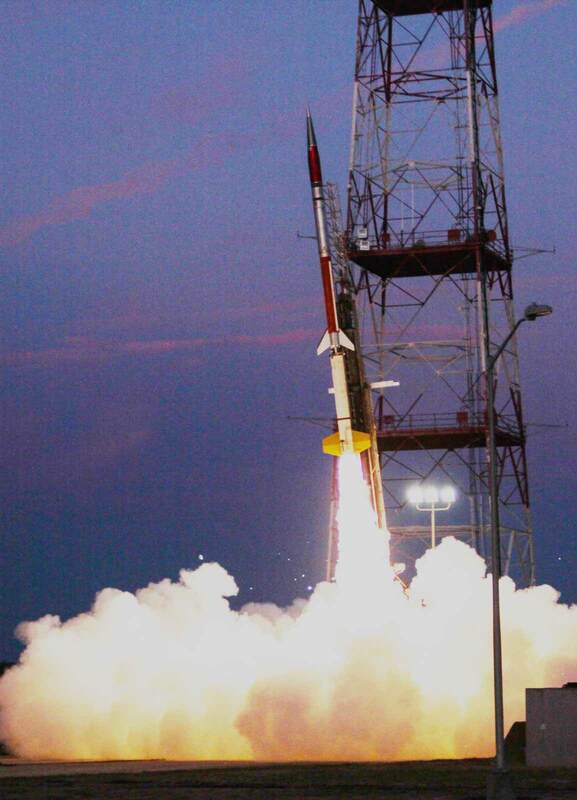 USIP rocket launches from Wallops. Image: Wallops Imaging Lab. 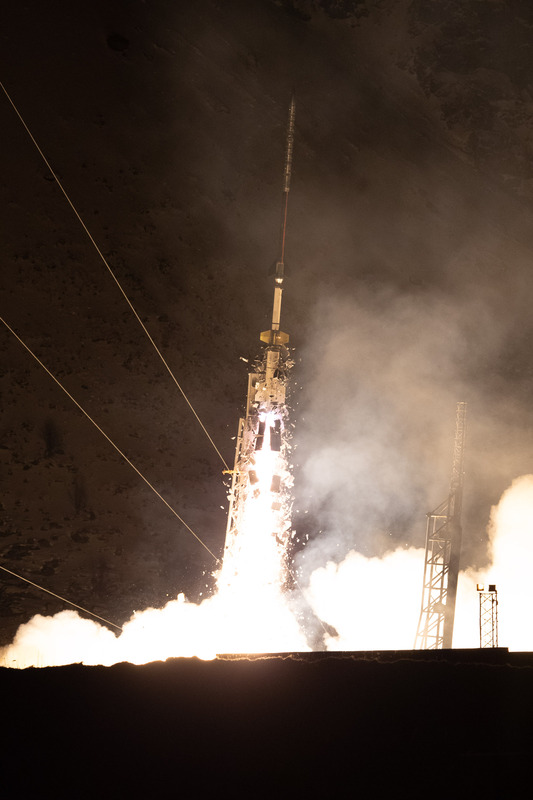 46.019 UO, Terrier-Improved Malemute sounding rocket was launched from Wallops Island, VA on March 25, 2018. The purpose of the University Student Instrument Program (USIP) is to encourage participants to seek future involvement in space-based science missions by providing university undergraduate level students and faculty with a space flight opportunity that will allow their custom built experiments to be exposed to the space environment. 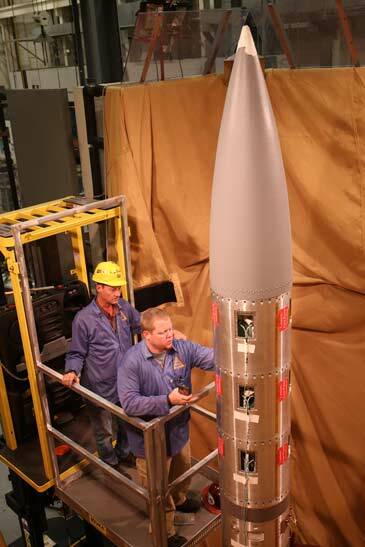 One of the SuperSoaker payloads on the MOI table at Wallops. 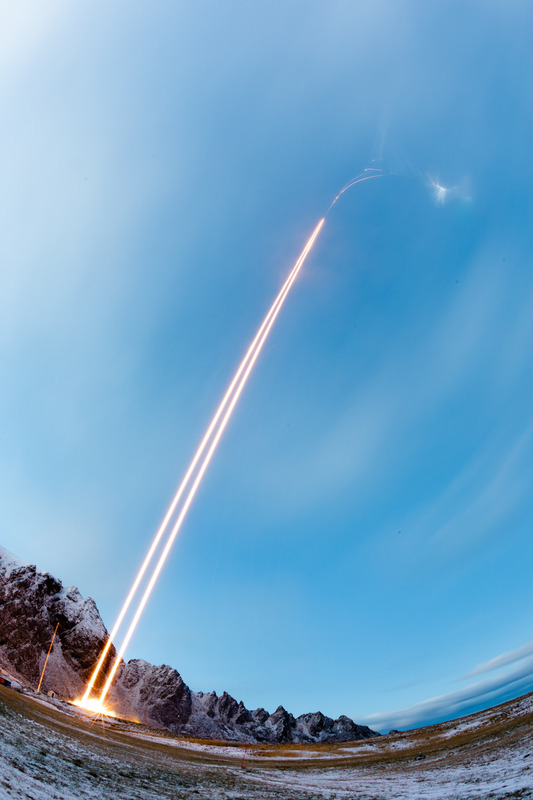 41.119, 41.120 & 41.122 CE, three Terrier-Improved Orion sounding rockets were launched from Poker Flat Research Range, AK on January 26, 2018. The purpose of the Super Soaker missions is to study the time dependent neutral chemistry and transport of water in the upper atmosphere and to determine the resultant impact on the local temperature and Polar Mesospheric Cloud (PMC) formation. 36.329 UH Terrier-Black Brant was launched from Poker Flat Research Range, AK on January 19, 2018. The purpose of the Diffuse X-Rays from the Local Galaxy (DXL-3) mission was to study the physics associated with the Solar Wind Charge Exchange (SWCX) and the Local Hot Bubble (LHB). 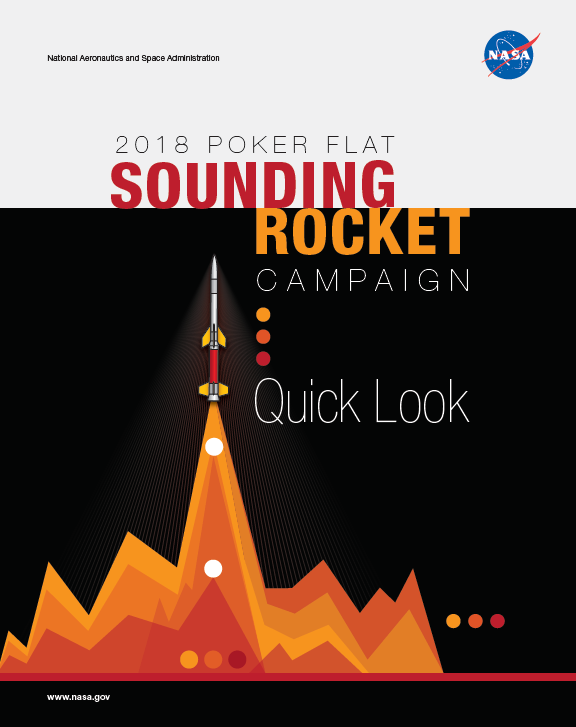 Four sounding rockets are scheduled for launch from Poker Flat, AK in January 2018. Click on image to download or view the infographic about these launches. 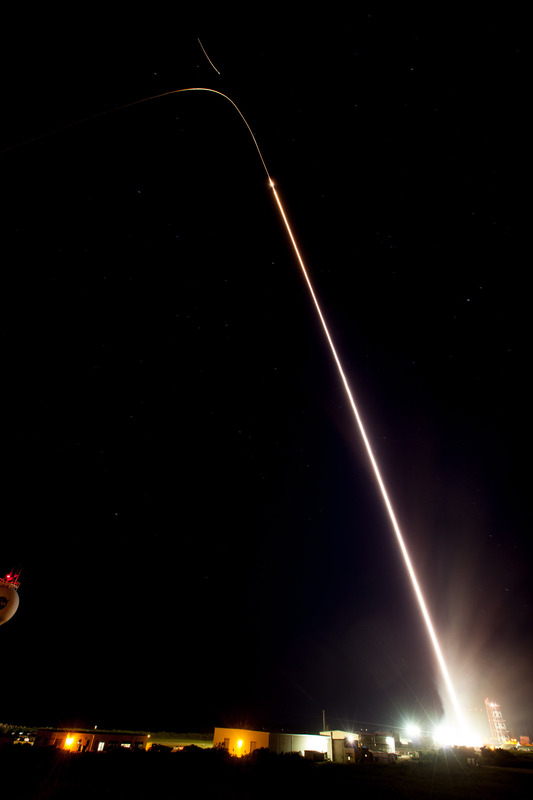 12.085 DR was launched from White Sands Missile Range, NM on November 16, 2017. The purpose of this mission was to demonstrate the Sabre Zombie hardware, software, support equipment and concept of operations. 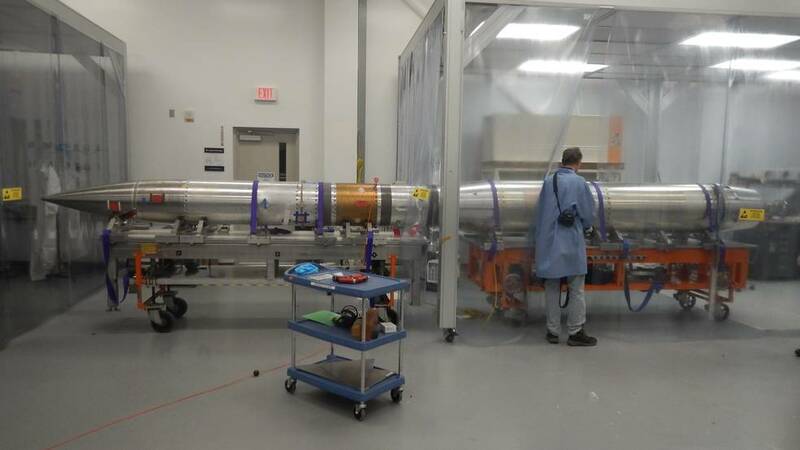 DEUCE payload at Wallops for testing. 36.311 UG Terrier-Black Brant was launched from White Sands Missile Range on October 30, 2017. The Dual-channel Extreme Ultraviolet Continuum Spectrograph (DEUCE) payload was designed to observe the only two non-white-dwarf stars in the Milky Way known to have a sufficiently low neutral hydrogen column density to measure their ionizing radiation directly: Beta Canis Major (βCMa) and Epsilon Canis Major (εCMa). The target for this mission was βCMa. 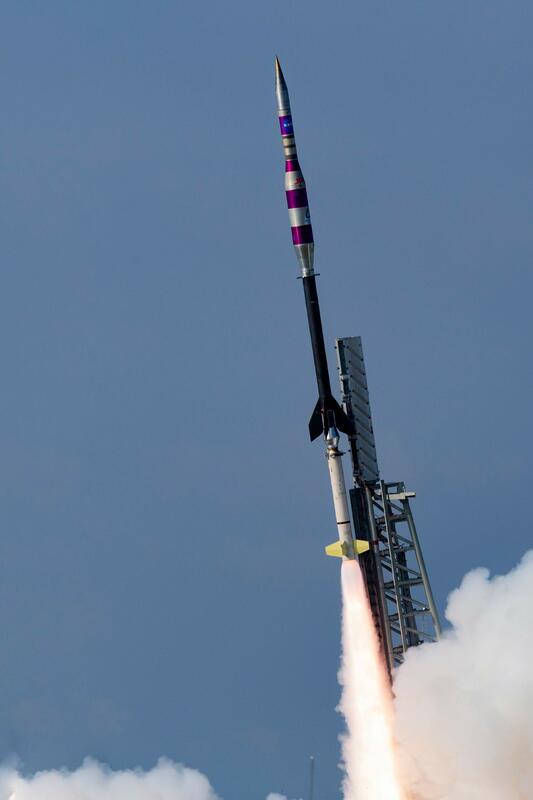 36.326 NR Terrier-Black Brant was launched from Wallops Island, VA on October 4, 2017. The main objective of the ASPIRE mission was to test parachute systems in a low-density, supersonic environment for future missions to Mars. 29.042 UE Terrier-Malemute and 36.321 UE Terrier-Black Brant were launched from the Kwajalein Atoll, Marshall Islands on September 9, 2017. The Waves and Instabilities from a Neutral Dynamo (WINDY) payloads were designed to investigate the post-sunset equatorila F-region ionosphere and the factors that predispose it to equatorial spread F (ESF). 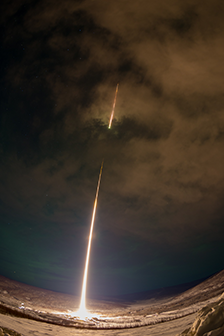 46.017 UO Terrier-Improved Malemute was launched from Wallops Island, VA on August 13, 2017.The RockSat-X mission carried student developed experiments and is a follow on mission to RockOn and RockSat-C. RockSat-X experiments are more advanced than RockOn and RockSat-C and include full featured sounding rocket support systems, such as telemetry, attitude control and recovery. RockSat-X experiments are exposed to the space environment enabling measurement of variables outside the payload. 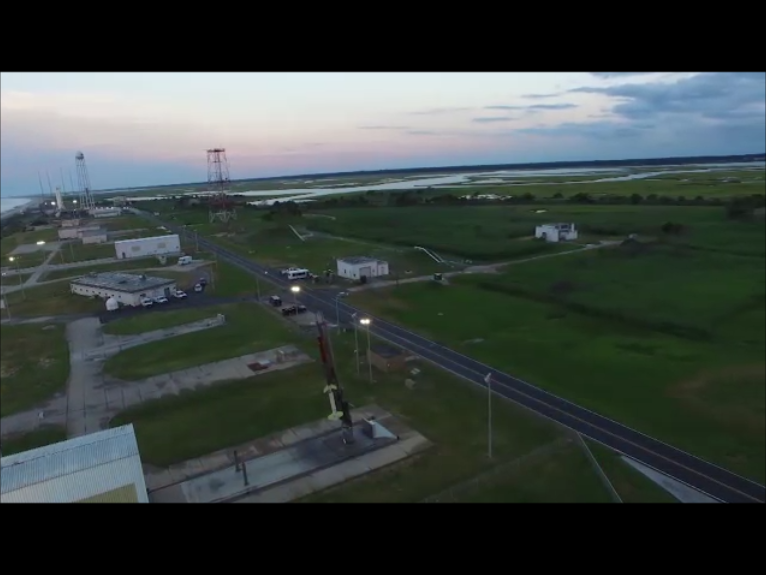 Terrier-Improved Malemute lifts off from Wallops Island. Credit: Terry Zaperach/Wallops Imaging Lab. 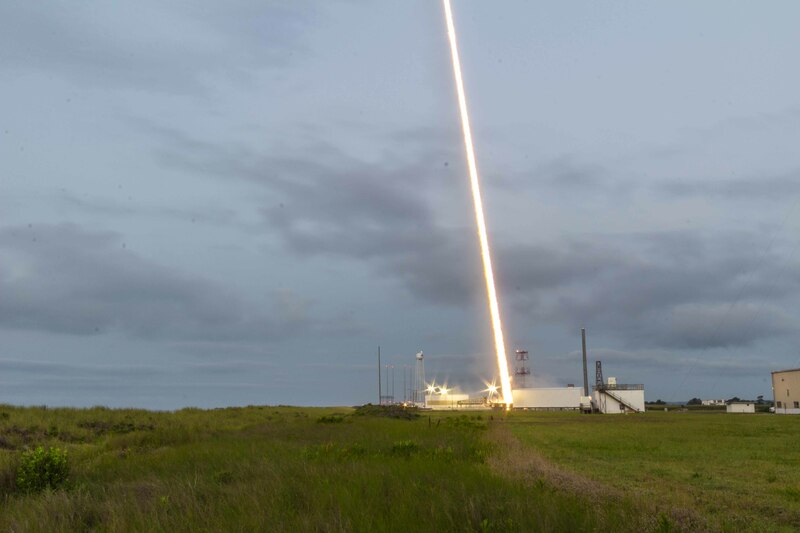 46.015 GT Terrier-Improved Malemute was launched from Wallops Island, VA on June 29, 2017.The primary objective of this mission was to test a new ampule deployment system. 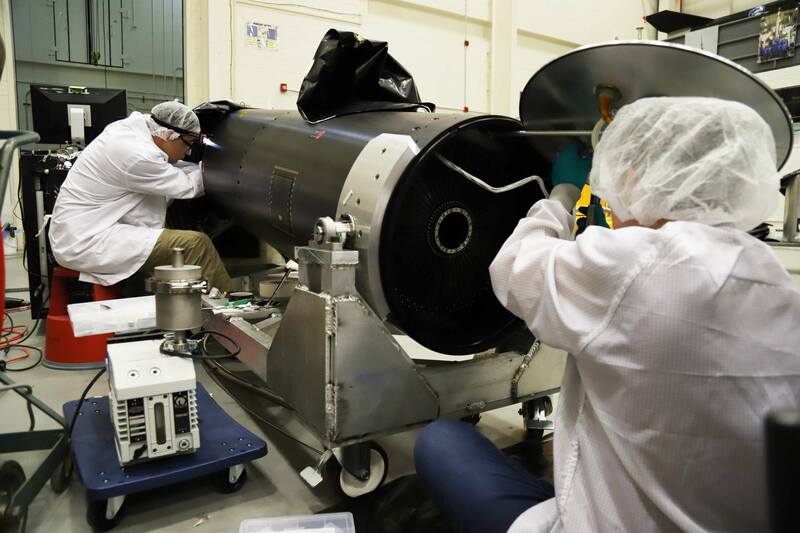 36.323 US Terrier-Black Brant was launched from White Sands Missile Range, NM on June 26, 2017.The Colorado High-resolution Echelle Stellar Spectrograph (CHESS) is designed to enable new scientific studies of the Local InterStellar Medium (LISM). The LISM provides an opportunity to study general ISM phenomena up close and in three dimensions, including interactions of different phases of the ISM, cloud collisions, cloud evolution, ionization structure, thermal balance, turbulent motions, etc. Understanding the structure of the LISM is important in evaluating the cosmic ray environment and the potential habitability of nearby exoplanets. 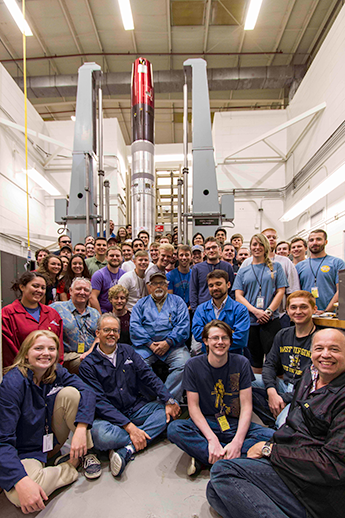 41.121 UO Terrier-Improved Orion was launched from Wallops Island, VA on June 22, 2017. The RockOn workshop is an introductory flight opportunity to provided exposure to, and spark interest in, space based science missions. This is accomplished by flying two classes of experiments. First time participants will generally fly the simpler kit built experiment. As educational institutions gain more experience, it is expected they will progress towards developing their own unique RockSat-C class experiments. This was the 10th flight of the RockOn! payload. 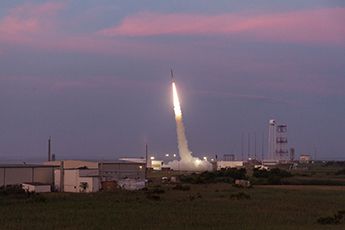 SubTec-7 launches from Wallops island, VA.
36.317 GP Terrier-Black Brant was launched from Wallops Island, VA on May 16, 2017.The primary purpose for this technology demonstration mission was to test the NSROC Forward OGIVE Recovery System (N-FORSe) and the Water Recovery Shutter Door. Both technologies are developed to enhance program capabilities. Several other experiments were also supported on this flight. 36.309 US Terrier-Black Brant was launched from White Sands Missile Range, NM on May 5, 2017. The purpose of the RAISE sounding rocket mission was to observe and analyze dynamics and heating of the solar chromosphere and corona on time scales as short as 100 ms. 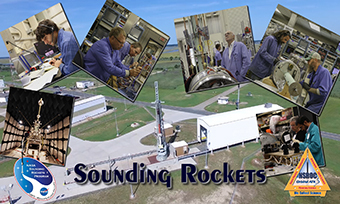 This video shows people working in the Sounding Rockets Program and the various aspects of manufacturing, assembly, integration, testing and launch operations. File size: 530 MB. Click on video to play. Link to smaller file. 36.304 UE Terrier-Black Brant was launched from Poker Flat Research Range, Alaska on March 1, 2017. 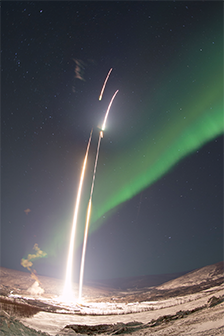 The purpose of the ISINGLASS sounding rocket mission is to sample multiple locations simultaneously in the auroral ionosphere and to take gradient measurements of plasma parameters. This was the first of two identical rockets to be flown into two separate events (ie, quiet early evening arc vs dynamic rayed arc); each rocket had a large subpayload, and four small deployable payloads. 36.301 and 36.306 UE Terrier-Black Brants were launched from Poker Flat Research Range, Alaska on March 1, 2017. The two rockets were launched 90 seconds apart to two different apogees. The main objective of this investigation was to understand the height dependent coupling processes that create localized neutral “jets” in the upper atmosphere associated with the aurora, their driving conditions, and their associated heating and neutral structuring. 36.303 UE Terrier-Black Brant was launched from Poker Flat Research Range, Alaska on February 22, 2017. 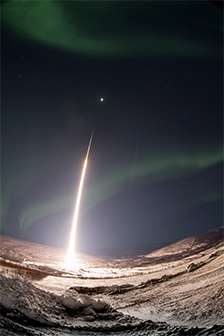 The purpose of the ISINGLASS sounding rocket mission is to sample multiple locations simultaneously in the auroral ionosphere and to take gradient measurements of plasma parameters. This was the first of two identical rockets to be flown into two separate events (ie, quiet early evening arc vs dynamic rayed arc); each rocket had a large subpayload, and four small deployable payloads. 36.302 UE Terrier-Black Brant was launched from Poker Flat Research Range, Alaska on January 27, 2017. The purpose of the PolarNOx mission was to measure the abundance and altitude of peak abundance for nitric oxide. Nitric oxide is created by the Aurora, but in the polar night there is no signicant process for destroying the nitric oxide. Under appropriate conditions nitric oxide can be transported to the stratosphere where it will catalytically destroy ozone. 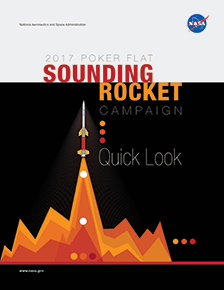 Five sounding rockets are scheduled for launch from Poker Flat, AK in early 2017. 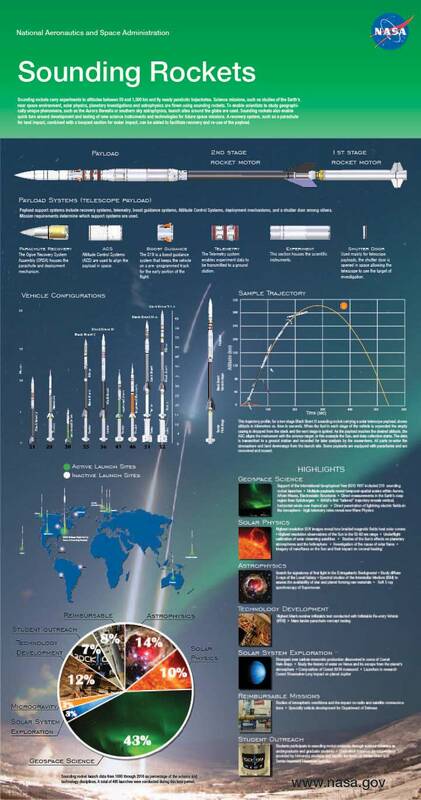 Click on image to download or view the infographic about these launches. 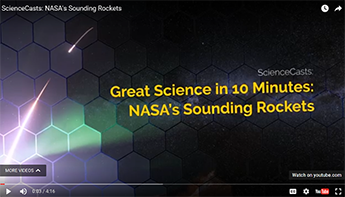 This video shows sounding rocket payload manufacturing, assembly, integration, testing and launch operations. Click on video to play.